How would you feel about paying one mana to draw six cards and get six 5/5 fliers with haste? Insane, right? This is what happens when you cast Brainstorm with The Locust God, Alhammarret’s Archive and Coat of Arms on the battlefield. Mind you, I am not too fond of four card combos. So how about a two card combo? Kindred Discovery naming Insect to draw your whole library? Best make sure you have a way to stop drawing cards (or a Laboratory Maniac in play) because that enchantment doesn’t have a “may” trigger! Or maybe you prefer a one-two punch with Skullclamp and Ashnod’s Altar to generate infinite mana and Insect tokens. This, and more, is the power of The Locust God. For this installment of the Pursuit of Knowledge series, we will explore the realm of Izzet, using the ranking of cards from EDH gameplay data to build a deck around a commander from this guild. I have been working hard these past few weeks to enter new gameplay data from last fall’s MTG Muddstah, Commander Clash, and Game Knights matchups. We now have data from over sixty new games, which means we have better rankings overall and a more diverse card pool. EDHREC database flourishes with 11,770 Izzet decks from 22 different commanders. The pool of cards that can be ranked with the augmented Command Zone gameplay data covers 596 spells and 137 lands. The original Command Zone gameplay data contained 29 games featuring an Izzet commander, with The Locus God at the helm eight times. With 1,247 decks, The Locust God, our pick for this article, is not the most popular commander on EDHREC (Mizzix of the Izmagnus has about 50% more decks than the Locust). However, the mixture of chaos and tempo that lends itself to The Locust God brews best exemplifies the Izzet. The Locust God creates a 1/1 blue and red Insect creature token with flying and haste every time we draw a card. The more cards we draw, the more tokens our fearless leader pumps onto the battlefield. With this token army, we can swarm our opponents, or leverage their presence to generate mana, play more cards, and trigger ETB abilities that lead us to victory. The Locust God can also loot, and does not require to tap to do so, which means we can perform this action any number of times, as long as we can fulfill the mana requirement. If we can find a way to generate infinite mana, we will be able to draw cards from our library until we find the tools we need to close the game. The most effective way to draw cards is with “wheel” effects. Coined after the iconic Wheel of Fortune card, a wheel effect usually requires players to discard their hand, then draw a number of cards. In the case of Wheel of Fortune, that number is seven, but in some cases, like Windfall, the amount varies. With The Locust God on the battlefield, playing Wheel of Fortune amounts to seven cards and seven 1/1 fliers with haste, all for just three mana. Not bad! With additional enhancers, this can get pretty nasty. Imagine having a Coat of Arms in play. These 1/1 fliers transform into 6/6 fliers, enough to dispose of a player on the spot. As we normally do in this series, we will look at the usual categories, ramp, card advantage/filtering, disruption, mass removal, and lands. We will also add two new categories, specific to this commander: ‘core synergy: wheels’ and ‘core synergy: swarm.’ We will select the cards for our deck based on the gameplay data card ranking, ensuring that we maximize the synergy between the cards to leverage our commander’s abilities. 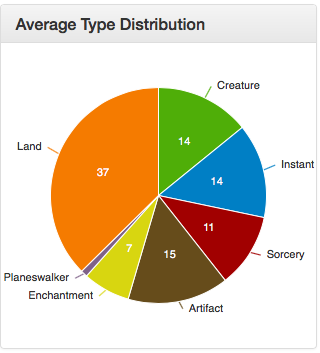 The average card type distribution of a deck with The Locust God commander and the average mana curve of an average deck are shown below. 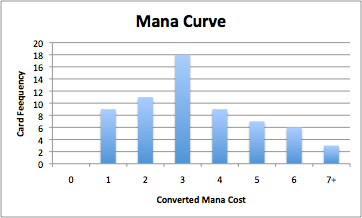 We will tailor our how card type distribution and mana curve in a similar fashion. The cards that we select for our deck will be shaded with a colored background in each table. The card rank will also be identified beside the card name. A card with no rank is a card that does not have enough presence in the gameplay data to rank. We need to use our best judgment to select unranked cards. 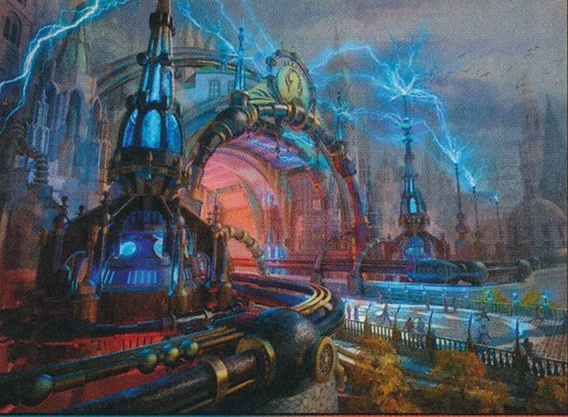 The tables presented in this article can be used as templates to build future Izzet decks. With no access to green, we mostly rely on mana rocks for ramp. Since our commander has a high casting cost of six CMC, and since our commander’s presence is important to our game plan, we add more mana ramp than usual. For the first time in this series, Sol Ring makes the cut. While in decks that have access to green, it is not rated very high, in Izzet, it sits at a very respectable 19th position. Hooray for Sol Ring! If there is a card that deserves attention for ramping in this deck however, it is Mana Echoes. This card generates tons of colorless mana. Playing a Brainstorm nets three colorless mana. Playing a Wheel of Fortune nets 21 colorless mana! Draw a Pull from Tomorrow with the Wheel and if we have access to two additional blue mana, we can draw 21 cards and net… huh… 231 colorless mana!!! To make Paradox Engine more effective, we need to ensure we have enough mana rocks in play. We include eight of them in our deck. Gauntlet of Power not only provides us ramp, but also makes our swarm of Insect tokens more dangerous, doubling their power and toughness. Ashnod’s Altar and Phyrexian Altar enable some of the combos in our deck. This category presents the best of the card draw, card filtering, and card tutoring available in Izzet. This deck wants to draw cards, so there will be strong focus on this category. Blue and red do not feature as many good tutor cards as black and green, so we have to work a bit harder to get the pieces from our combos. As mentioned in the introduction, Skullclamp and Ashnod’s Altar provides us infinite mana and Insect tokens. To help us find these two cards, we added Trinket Mage, Fabricate and Whir of Invention. Mystical Tutor may help us find two of these three tutors. If we have enough Locust tokens on the battlefield, bringing Coat of Arms into play at instant speed with Whir of Invention may cause lethal damage. Psychosis Crawler is another good target for Whir of Invention. Alhammarret’s Archive is our own special Doubling Season, doubling any effect that would take place when we draw a card, like creating Insect tokens. Kindred Discovery requires special attention. Naming Insect and playing a cantrip with The Locust God in play will force us to draw our entire library, and lose the game. However, our deck is built with responses that should allow us to win the game before we draw our last card. The inclusion of Flash ensures we can cast any of Purphoros, God of the Forge, Psychosis Crawler, or Laboratory Maniac along the way. Disallow can also be played to break the drawing loop by countering Kindred Discovery‘s triggered ability at any time. What if Flash or Disallow are in the graveyard? We can always use Snapcaster Mage to flash them back, or if all else fails, we can discard Kozilek, Butcher of Truth (with The Locust God‘s loot ability) to shuffle back our graveyard into our deck and continue the drawing process until we find what we need, creating Locust tokens along the way. We just have to set aside enough mana to implement our plan. Another combo that lets us draw our entire library and create a bunch of mana is the combination of Murder of Crows and Ashnod’s Altar or Phyrexian Altar. Sacrificing one of our Locust token to an Altar with Murder of Crows in play will allow us to draw a card, which will create a new Locust that can be sacrificed. Rinse and repeat. Bident of Thassa could be viewed as a card draw doubler. Since our tokens have some form of evasion in flying, for each card we draw, Bident of Thassa gives us a good chance to draw another card the same turn by dealing damage with one of our brand new Locusts. Kozilek, Butcher of Truth‘s presence in the deck is mostly there to help bring back the cards we need from the graveyard to our library. Left unchecked, Consecrated Sphinx will create a swarm of Insect tokens. Playing a wheel card with this critter in play puts us in a very good position to win. Combined with Psychosis Crawler, a wheel effect might be enough to clinch the game. Most disruption that we include in the deck is meant to protect our game plan. We have already talked about the role of Disallow in the Kindred Discovery combo. Bident of Thassa may help us open a breach into one of our opponents by forcing an opponent to attack, leaving them open to our own Locust attack in our next turn. Pact of Negation is a nice safeguard to avoid an opponent disrupting one of our combos. Mass removal spells have been selected to leverage the wheel and swarm flavor of our deck. Imagine playing Cyclonic Rift just before the start of our turn, then playing a wheel. I can hear the crickets – or should I say Locusts – buzzing already. Several wheel effect cards are present in this deck. These cards allow us to draw chunks of our deck at reasonable cost, creating a bunch of Locust tokens and at the same time letting us find the tools we need to win games. Wheels can also disrupt opponents by making it harder for them to assemble the pieces they need to win on their terms. Psychosis Crawler and Molten Psyche can really hurt our opponents. This deck is all about drawing cards, so, with Psychosis Crawler in play, damaging our opponents every time we draw a card can be devastating. Playing a wheel effect cards forces our opponents to draw cards, so Molten Psyche is bound to be effective in damaging our opponents. Commit // Memory brings both disruption and wheel effect. Arjun, the Shifting Flame is an all-star in this deck. Sure, if we end up with all the pieces of a winning combo in hand when Arjun is in play, we’ll be out of luck, but the upsides are so good. With The Locust God in play, Arjun adds a number of Locust tokens equal to our hand size every time we cast a spell, a nice bonus. It should not take long before we flood the battlefield with Insect tokens. In addition, Arjun lets us sift through our deck to find one of our numerous finishers: Purphoros, God of the Forge, Psychosis Crawler, Paradox Engine, Murder of Crows, Ashnod’s Altar, Skullclamp, and Coat of Arms. We do not need to rely solely on combos to secure a win. We will likely generate several Locust tokens that can simply swarm our opponents. This category highlights the tools that we can use to attain this goal. Purphoros, God of the Forge and Impact Tremors give us another set of finishers. Every card drawn will translate into direct damage to each opponent. Purphoros, God of the Forge can also be used to pump our creatures. Playing Sakashima the Impostor copying The Locust God doubles the number of tokens created on card draw. Chasm Skulker brings some resilience to our board state. A board wipe with Chasm Skulker in play may get rid of our Locust tokens, but these will be replaced with new tokens when Chasm Skulker dies. Do we really need more win conditions? What if we have drawn our whole deck and still have not find a way to win? How about Laboratory Maniac? As mentioned above, we include Snacapster Mage, or its Guilds of Ravinca replacement, Mission Briefing, to recur cards that could have been wheeled in our graveyard. Standalone spells are spells that do not fit any of the above categories and work well on their own or in concert with the commander. There is one outstanding standalone spell that we can leverage in our deck to complement our game plan: Paradox Engine. This spell can ignite some explosive turns. With a wheel effect to start the ball rolling, we might be able to string several spells if we have access to one or two mana rocks. Another standalone spell that we add to complement our game plan is Flash. This spell provides us an answer in case we ever play Kindred Discovery and want to cast one of our creatures (like Laboratory Maniac) before we draw our entire library. We tailor our land package to provide the necessary mana fixing and add a few tools that help us with our game plan. The presence of Myriad Landscape and Temple of the False God adds some ramp to our deck. Desolate Lighthouse and Cephalid Coliseum help us in our game plan of drawing cards to create Locust tokens. Reliquary Tower lets us keep all the cards we draw in our hand, which could make for an impressive Windfall or Winds of Change. Lands with Cycling ability, such as Forgotten Cave and Lonely Sandbar, work well with The Locust God, but I have left them out to avoid lands that come into play tapped. They could be added depending on your playgroup’s power level. Buried Ruin and Academy Ruins may help us retrieve the cards from the graveyard that might have been wheeled earlier. With the help of our extended gameplay data, we have been able to put all the pieces together that, while never knowing for certain what to expect, should allow us to pull key elements from our bag of tricks that should turn us into legitimate contenders in most games. In the process, we have come up with a list of templates per category that could be used to build many more Izzet decks. If you are not into combos, it is possible to tone down the deck, replacing cards like Murder of Crows, Ashnod’s Altar, Phyrexian Altar, and Kindred Discovery with ramp alternatives like Astral Cornucopia, Mind Stone, and Swarm alternatives like Hellrider or Obelisk of Urd. How do you feel about combos? Are they banned in your playgroup? Which is your preferred Izzet commander? Any inclusion in your Locust God deck that you find especially effective? In our next installment, we will take a look at Orzhov. Ravnica Allegiance brings us fresh material for the Orzhov guild. Lets see if any of these cards make it in to our build.